Recover all types of Pictures,Audios and Videos. OST files proffer an easy functionality as it provides an offline working therapy to the users. Indeed, this email client is preferred in many of the business enterprises. However, at time there are several dwelling negative actions that percolates a situation of email loss from the client. There can be many reasons, such as an issue while synchronization with MS Exchange Server, logical drive error, MS Outlook corruption, virus attack, accidental deletion, and there are many more to it. Succumbing to the situation of email loss is not the last thing because a third party software can fetch your mailbox in accessible format, without asking or demanding much from the client. 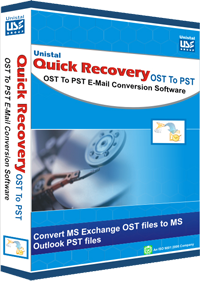 The Quick Recovery Application for OST to PST email conversion is the apt utility, which can be used for the conversion process. This software is equivalently developed with latest techniques and functions that further initiates an easy and speedy performance. The role of this program is to convert all the OST emails into the format of PST MS Outlook and further restoring them in a location that is provided by the user. The features and characteristics of this email client is promising and delivers the entire result within a short span of time. The best feature of this application is, it proffers an intuitive and interactive function of converting the emails, which keeps a layman user out of any sort of tension. To install the software on the computer, a user is required to invest on it. Download it further and install the application on the computer. Significantly, run the mode of conversion and wait for few minutes. I tried this application to convert my OST emails and it took maximum 5 minutes to fetch my emails back in PST format.